The third annual “French Cinema Tour 2018” kicked off Thursday, featuring eight French films that will be screened prior to their official opening here. The opening ceremony was held at Hotel Shilla in central Seoul, where the festival’s “Etoile du cinema” awards were given to French audiences’ favorite Korean movie of the year, and the organization or individual deemed to have contributed the most to promoting French films in Korea. Around over 200 participants attended the opening ceremony, including French Ambassador Fabien Penone and Renault Samsung Motors CEO Dominique Signor. A number of Korean celebrities including Lee Yeon-hee -- the honorary ambassador of the French Tourist Authority -- veteran actress Ye Ji-won also made the appearance. Actress and K-pop star Choi Soo-young of Girl’s Generation hosted the ceremony. “Etoile du cinema,” created this year, the film “Burning” and Seoul Pride Film Festival. 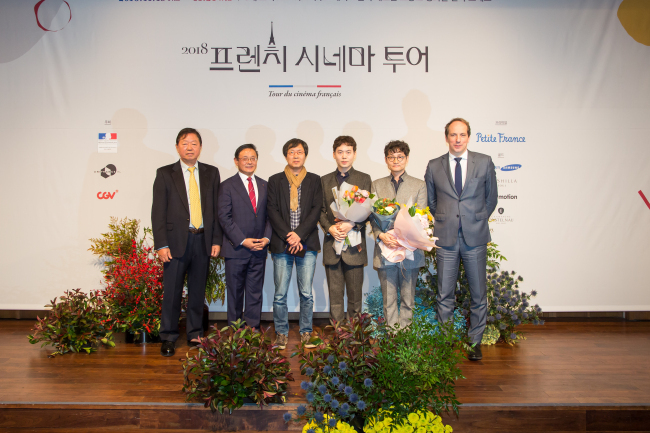 Film producer Lee Jun-dong, and Seoul Pride Film Festival Commissioner KimCho Kwang-soo and programmer Kim Seung-hwan attended the ceremony to receive the awards. “Burning,” which illustrates the lives of young Korean people, peaked at third place in the French box office, selling over 180,000 tickets in France. Seoul Pride Film Festival was recognized for displaying foreign films to extend LGBT rights. “French Cinema Tour 2018” is jointly hosted by the French Embassy, Unifrance and CGV, is held across six cities. Seoul, Busan, Daegu, Daejeon, Gwangju and Suwon in Gyeonggi Province will each screen eight French movies at CGV Arthouse Theaters until Nov. 28. Movie lovers can meet French films such as “La Ch’tite famille (Family is Family),” made by French superstar Dany Boon and director Olivier Assayas’s “Doubles Vies (Non-fiction),” which illustrates the story of how Parisian publishers adjust to technology based world. 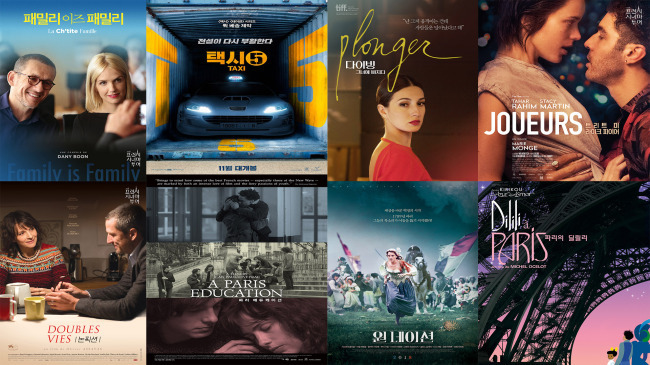 Also “The Nation,” which portrays the French Revolution starring French veteran stars and French action blockbuster “Taxi 5” is to be screened along with “Plonger (Diving),” “Joueurs (Treat Me Like Fire),” “A Paris Education” and “Dilili in Paris” are currently screening at CGV Arthouse for 14 days from Thursday. The event was created to commemorate the 150th anniversary of relations between Korea and France, and is regularly held in every November to deliver French films to Korean movie fans before they go on general release here.